This report provides the 2017 Scientific Consensus Statement for the Great Barrier Reef—a review of the significant advances in scientific knowledge of water quality issues in the Great Barrier Reef to arrive at a consensus on the current understanding of the system. The consensus statement was produced by a multidisciplinary group of 48 scientists with expertise in Great Barrier Reef water quality science and management, led by TropWATER James Cook University, with oversight from the Reef Water Quality Independent Science Panel. 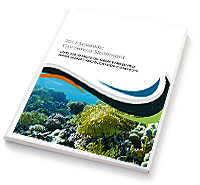 The Statement is the foundational document that provides the scientific understanding underpinning the Reef 2050 Water Quality Improvement Plan 2017–2022. The Scientific Consensus Statement is updated every five years to ensure that Reef policy remains up-to-date and based on the best available evidence. The decline of marine water quality associated with land-based run-off from the adjacent catchments is a major cause of the current poor state of many of the coastal and marine ecosystems of the Great Barrier Reef. Water quality improvement has an important role in ecosystem resilience. The main source of the primary pollutants (nutrients, fine sediments and pesticides) from Great Barrier Reef catchments is diffuse source pollution from agriculture. These pollutants pose a risk to Great Barrier Reef coastal and marine ecosystems. Progress towards the water quality targets has been slow and the present trajectory suggests these targets will not be met. Greater effort to improve water quality is urgently required to progress substantial pollutant reductions using an expanded scope of tailored and innovative solutions. Climate change adaptation and mitigation, cumulative impact assessment for major projects and better policy coordination are also required to protect the Great Barrier Reef. There is an urgent need for greater investment in voluntary practice change programs, the use of regulatory tools and other policy mechanisms to accelerate the adoption of practice change, and robust monitoring and evaluation programs to measure the rate and effectiveness of adoption. Strengthened and more effective coordination of Australian and Queensland government policies and programs, further collaboration with farmers and other stakeholders, and strong evaluation systems are critical to the success of Great Barrier Reef water quality initiatives. Priorities for reducing pollutant loads are now established at a catchment scale, based on the exposure of coastal and marine ecosystems to land-based pollutants, and should be used to guide investment. A greater focus on experimentation, prioritisation and evaluation at different scales, coupled with the use of modelling and other approaches to understand future scenarios, could further improve water quality programs. Chapter 1 (PDF, 3.0MB) describes Great Barrier Reef marine and coastal aquatic ecosystem status and condition, identifies the primary drivers, pressures and threats to these systems and the known effects of land-based pollutants based on understanding derived through monitoring and modelling (Schaffelke et al., 2017). Chapter 2 (PDF, 2.9MB) describes the sources of pollutants, considered as the hazards to Great Barrier Reef ecosystems (Bartley et al., 2017). Chapter 3 (PDF, 8.4MB) applies the risk assessment components of the framework by evaluating the likelihood, consequences and quantified risk to the Great Barrier Reef coastal aquatic and marine ecosystems, particularly from different nutrient species, suspended sediment (including different size fractions) and pesticides (Waterhouse et al., 2017). Chapter 4 (PDF, 4.6MB) considers management of the risks (Eberhard et al., 2017). Chapter 5 (PDF, 2.3MB) presents an overall synthesis and draws on the previous chapters to present a management prioritisation and discussion on management implications of the new knowledge (Waterhouse et al., 2017). It also identifies uncertainties and where there remain differences in the interpretation of the scientific evidence (identified in Chapters 1 to 4).